If you have kids you will no doubt know what a squishie is, if you have kids and you don’t know what these are then where have you been, you are seriously late to the party! But fear not we can fill you in on everything you need to know and even give you the chance to get your hands on one of these cute little squishies, whether you to choose to keep it for yourself or share with a child of your choice is entirely up to you. Squishies are basically the “in thing” with kids aged 5-13 at the moment and I’ll be honest as far as trends go I actually quite like this one. Instead of the usual tiny bits of plastic rubbish that you find under the sofa, stuck in the hoover nozzle and embedded into the soles of your feet for months after the children have given up playing with them, these are larger, cuter, softer AND they even smell nice. Squishies are made from soft rising foam so they are squishie and cuddly as well as being cute. There are lots of different ones to collect and Smiggle have just launched season 2 which I am sure will be making an appearance on many a Christmas list this year. The second series is made up of 8 new characters. My favourite obviously being the adorable strawbeary – a strawberry crossed with a bear! 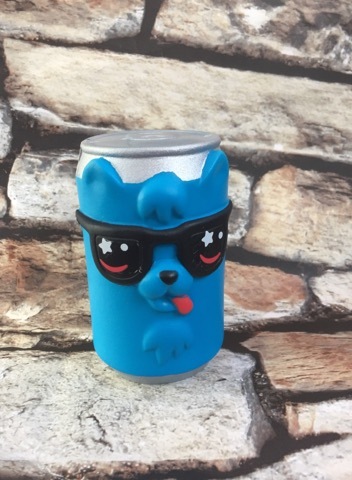 Whereas the tiddler absolutely loves soda pup the soda can crossed with a puppy. These cute little fellas retail at £9 and are available in all smiggle shops as well as online and if you haven’t already collected the first season then you can still get your hands on these too. At time of writing these were on offer for 2 for £12 so worth checking that out too and putting them to one side for presents later in the year. For your chance to win a squishie just enter below and be sure to tell me which one you think is the cutest. Strawbeary here! My little girl Syd loves these things. I love the cake one! We love the cake ones! Soda Pup is our favourite. Love them all but apparently Tacosaurus is my favourite! Smiggle Squishies Series 2 Cat.